Mobile phone shop with an event space. Customers can feel the capability of smart phones. Dotcom Co.,Ltd. was established by CEO Mr. Atsushi Imagawa as a dealer of a mobile phone company; Tokyo Digital Phone (Softbank today) on February, 2000. Its headquarters is located in Kobe, and Dotcom operates 7 shops in the Kansai area, and 5 in the Kanto area. With a concept of "Mobile phones make your life richer. ", "SoftBank Hiroo" offers an event space for seminars using iPhone or iPad on the 2nd floor to convey the convenience and fun of smart phones. 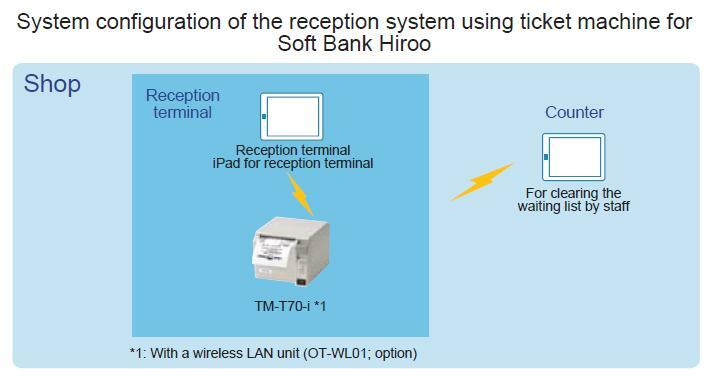 "SoftBank Hiroo" installed a reception system which uses iPads provided by Star Land K.K. Two iPads are used, one is located on the floor for the reception terminal, and the other for the devices to clear the waiting list by the staff. TM-T70-i receives print data for the reception process sent directly by the iPad through wireless LAN connection. TM-T70-i also can serve as a web server as well as a printer for number tickets, and established a smart reception system without the need for a PC. An innovative CEO Mr. Imagawa thought the traditional reception systems which only have a single function for reception reached their limit, and felt the need for a new reception system. Then, he came across a reception system using an iPad exhibited at the EPSON booth in an exhibition related to smart phones. There, he was introduced to Star Land K.K and eventually he put in place the system. Mr. Imagawa said, "In recent years, the customers' purposes of visiting our shops range widely and their inquiry is more complicated. By getting the customers to press the button for each purpose displayed on the iPad, we can provide more quality services because we will have a better understanding of the customers' purposes in advance. Besides, TM-T70-i has a compact body and wireless LAN connection is available, so I had no trouble finding a place to install it. I'm really satisfied with this smart and stylish reception system and improvement of service without spoiling the shop's atmosphere. Mr. Imagawa; CEO of Dotcom Co.,Ltd. 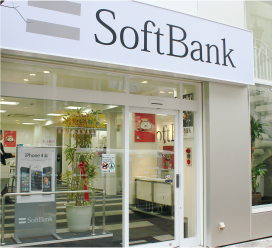 which operates SoftBank Hiroo, said the effect of installation of the reception system was as he expected. He said "Before the installation of this system, sometimes we kept the customers waiting for a long time even just for a purchase of accessories. After this system was put in place, we can provide prompt responses and more effective services because we already know the customers' purposes of visit in advance by getting the customers to press the button for each purpose displayed on the iPad located at the reception. Besides, through this process we can let our customers experience another possibility of iPod. From now on, I want to continue to create an environment where our customers naturally experience and feel that smart phones and tablets play new roles in the systems of the world." TM-T70-i made a PC-less smart reception system possible. Mr. Imagawa also told us about the great benefit of TM-T70-i's web server function. He said, "Most of the traditional reception terminals are large, robust and heavy because a computer is needed for them, so usually we have trouble finding where to place such a terminal or have to handle PC-related troubles. In contrast, TM-T70-i has software for reception in the built-in web server. Without the need for a PC, it requires less time and space for installation. In addition, TM-T70-i allows us to print directly to through wireless LAN connection, so we were able to determine the layout of the printer freely and we could create a stylish and smart reception system. Regardless to say, TM-T70-i is easy-to-operate and paper can be exchanged from the front, so since the installation we have been operating the system smoothly without any trouble. Ms. Keiko Adachi; supervisor and manager of the sales promotion department of Star Land K.K., told us in our interview, "System configuration of our reception system is only TM-T70-i and smart devices such as an iPad. Different from the traditional reception systems, no PC is used in the configuration of our system, so we could establish a reception system that requires less space with high cost performance. The buttons and background of the menu displayed on the iPad were customized according to the needs and the atmosphere of the shops managed by the Dotcom Co.,Ltd. "The decisive factors in selecting TM-T70-i are: 1) a web application can be installed in the printer, 2) printing can be made directly from the smart devices, and 3) developing a web application is very easy. By installing a web application in the printer, we eliminated the need for a PC and reduced costs and trimmed down the system configuration. Besides, there is no need to install the drivers to the smart devices, so we can establish a flexible system which does not depend on devices or the OS. Another attractive factor in selecting TM-T70-i is its WEB service print function that can print XML data (ePOS-Print API). We were able to develop the system in a short period, and could adjust it to the customer's needs flexibly because an item can be changed and a new item can be added easily using an iPad. We use EPSON receipt printers other than TM-T70-i and always feel a sense of security because EPSON provides on-site maintenance support 24 hours a day, 365 days a year.